The Lay Clerks of the choir of St George’s have recently released a new CD. Such recordings are just one part of the musical life of St George’s which ranges from music at daily services provided by the Organists, Lay Clerks and Choristers to concerts, recitals and recordings. To see what music is being sung at daily services this week in the Chapel find out more here (Services and Music at St George’s). 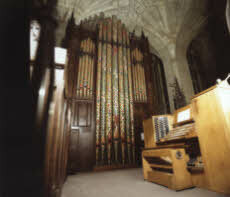 During the summer months there will be a series of organ recitals in the Chapel given by Tim Byram-Wigfield (Sunday 3 May), Ben Giddens (Sunday 7 June) and Organ Scholars (Sunday 28 June). For ticketing information please see here. The choir will perform at a concert in St George’s Chapel as part of the 40th Windsor Festival alongside the choir of King’s College, Cambridge (Visit Windsor Festival). This joint event in the 500th accession anniversary year of King Henry VIII marks the fact that both buildings were finished during his reign. To find out more about the choir of St George’s and the life of the Choristers at St George’s School find out more here (Sing at St George’s). A collection of musical manuscripts is held by the Archives and Chapter Library of St George’s. For more information on access to holdings click here. (*) “It is the first recording of Mundy’s Lamentations with the first bass part reconstructed by Jeremy Filsell and it’s from their recital of the Lamentations starting with the famous Tallis setting – by the halfway point of that I was hooked!